What do two garage saleing gals do when they come across something just too cool to pass up, even if they don't need it? They buy it anyway, of course, then they use their creative juices to transform the cool old stuff into something whimsical and fun. Well, those very items are starting to pile up around here, and so true to Out of the Attic's early home craft show roots, we have decided to sell our stuff again, only this time on a much grander scale. We have gone cyber by putting our stuff on Etsy! Yep, ETSY!!!! Please check out our new ETSY shop! So here is the fun part. You get to go digging around in the old Christmas trunk in our attic, and if we pick your name, you get an ornament from our Etsy store FREE! 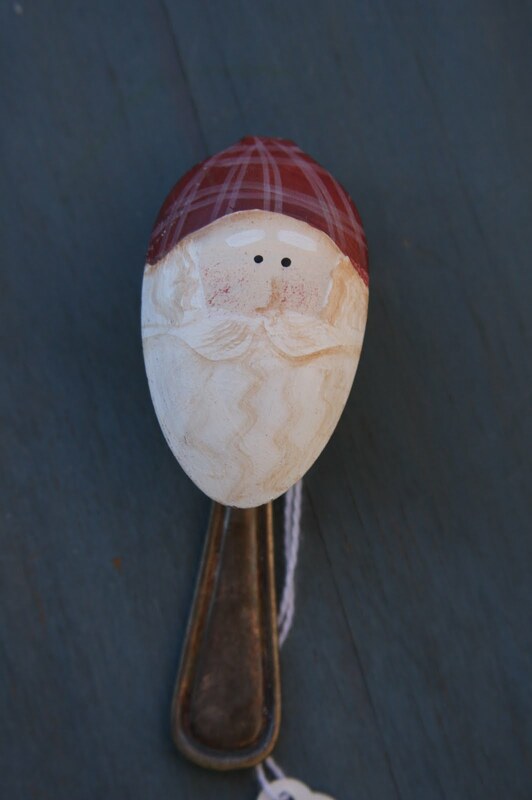 You choose: spoon santa, spoon snowman, snow baby, or spindle santa! Just tell us which you pick, and if we pick you, it's yours! * To enter leave us a comment on this post (if you don't have a blog, make sure to leave us an email address). *If you post about this giveaway on your blog, We'll give you an extra entry - make sure you tell us that you are posting about it. 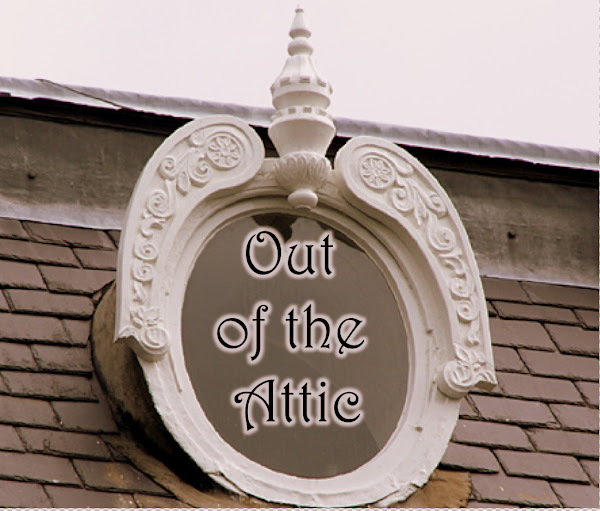 *If you become a follower of Out of the Attic (or if you are already a follower) we'll give you another entry- again make sure you tell us that you are following our blog. This drawing is open until Sunday night (Dec. 6) at 11:59 p.m. We'll post the winner early next week and get your ornament out to you so it will be on your tree by Christmas morning. Meanwhile, expect a few more exciting (well, exciting to us and hopefully to you) OA announcements from the Attic Gals, and keep checking our Etsy store for more fun items! Making More Room in our Attic! Hello all you Attic Diggers! We hope you all had a wonderful Thanksgiving, and are ready to jump with both feet into this holiday season. Last year, the Holiday season was, well, actually pretty rotten for both of the Attic Gals. (That is putting it mildly!) But this year everyone is healthy and life is good, and every indication is that this will be the best Christmas ever! The Attic Gals have a lot of fun stuff planned, and lots of ways to get creative that we are just hoping we can find time to get to in the next four short weeks! The holidays are such a great excuse to get creative! Beyond that, the Attic Gals also have some big projects in the works that we are excited about! We can't wait to show you what we have up our sleeves! Attic Gal Alysa is up to something pretty exciting, Attic Gal Rachelle is up to something entirely different, and together we are collaborating our efforts on even something else. We might have to do so reconstruction to make some more room in this Attic of ours for all of our projects we've got cooking. Meanwhile, get those Christmas decorations up, get a fire going, and a kettle of hot chocolate on, and we'll get this all done and announced ASAP! Watch for it! I'm feeling it! Are you? Here is a very easy, yet meaningful Thanksgiving tradition that you still have time to do! Every year my kids are in charge of making little packets of five candy corns in a piece of netting tied with raffia. Pilgrims had a custom of putting five kernels of corn on each plate before Thanksgiving dinner was served. In many old Plymouth families, the custom is still followed today. The five kernels of corn were chosen because prior to the first harvest, things were so bad that the daily ration was five kernels of corn per person per day. Imagine how grateful the survivors of the first horrible winter were for the abundant first harvest! The pilgrims put five kernels of corn on their plates to remind them of their great blessings. Let us also remember. The first kernel of corn reminds us of the autumn beauty around us. The second kernel of corn reminds us of our love for each other. The third kernel of corn reminds us of God's love for us. The forth kernel of corn reminds us of our friends. The fifth kernel of corn reminds us that we are a free people. It is a wonderful way to be reminded of the bounteous blessings enjoy! There is always so very much to be grateful for! I have been having some fun doing a little bit of fall and holiday stamping. I just love this darling pumpkin! Wouldn't these little guys be so cute sitting on each plate at Thanksgiving? It is so easy. Here is a little tutorial. Also, I had some leftover tops I cut off of some brown paper lunch sacks I used for another project, so I just used that for the stem (I hate wasting anything!) I cut them into strips that were about 1/2 inch wider that the diameter of the circles, and rolled them up like a cigarette, glueing down the edge. Then sponge the edges on one side of each of the circles with dark orange ink. Then fold each of the circles in half with the decorated/sponged side INSIDE the fold. Glue half of one circle to the next, until you have glued all 8 together. Before finishing the ball by gluing the beginning and end halves together, stick the brown paper stem into the middle, so it ticks up a bit from the top, and glue it all together. Punch out a green leaf with a leaf punch, and make some curls with a few very thin strips of green cardstock. Here is another pretty card. The pheasant was done with marker thumping - basically I thumped different fall colored markers directly onto the stamp before stamping. I love how this came out! There is a little pocket inside that is perfect for a gift card. I also had fun with my new ornament punch. I made these 3D ornament cards using the same idea as the pumpkin, only with 3 ornament punches. First I jumbo-wheeled, stamped, and ran the background through the Big Shot in an embossing folder. For the ornament, I embossed 1 Mary and Joseph and 2 Bethlehem images onto white glossy card stock, then using a sponge rubbed yellow ink in the middle and then blue around it. I punched them out, folded each in half, then glued them together, so the Mary and Joseph were in the middle. I added a ribbon and a bow, and glued the ornament onto the card. It flattens to put it in the envelope just fine. Here is another beautiful card done the same way, only much easier. The background was simply run through the embossing folder, and the ornament was simply stamped 3 times, punched out, and a bit of chunky clear glitter was added to the center of each. I think it is my favorite! This mix was made just for you and your family. Enjoy it as you discuss the blessings that the ingredients represent. Bugles (chips)- shaped like cornucopia, it represents the horn of plenty. Pretzels - represent our arms folded in thanks and prayer. Candy Corn - during their first winter the pilgrims were each allotted 5 kernels of corn each day as food was scarce. Dried Fruit - Thanksgiving is the celebration of the harvest. Nuts and Seeds - Seeds represent the potential of a bounteous harvest for the next season of they are planted well and tended. My first grader was assigned to bring the snack for his class today, and we wanted to make something with a fall theme. We decided to make these Indian Corn cereal snacks that I found in Family Fun Magazine a few years back. Click here for link. (We doubled the recipe and omitted the sticks). This was our first time making these, and they were so easy that Caleb did most of the work. It was so fun to make them together! They are made like rice crispy treats, only instead of crispies you use Kix cereal with some diced dry fruit tossed in. Let it cool for about 5-10 minutes, then form into corn cob shapes with buttered hands. We cut up fruit rolls to make the husks. They turned out really darling, and tasted surprisingly good! Make some of these corny treats with your kiddos this weekend! I love decorating for Fall! And the first day of November, my witch lair comes down, and the fall decor goes up. My style is glitz and gold! The more sparkle and gold the better. Here is one little trick picked up from Martha Stewart, that is so quick, and cheap, and gives me just the look I'm after. I spray painted her in a luscious, brilliant gold paint. I love that the Midas touch now comes in a convenient can! May you Thanksgiving be GOLDEN!